We are passionate about horses and their unique relationship with humans. 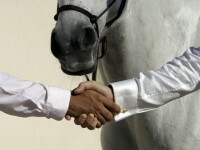 We strive to bring horses and humans together in ways that add value to both. In every aspect of our teaching, training, grooming and caring, we instil the HoofbeatZ™ core values – trust, dignity and fun. We believe that interaction with horses should be available to anyone regardless of their background or experience and should not be exclusive or elitist. We take pride in welcoming anyone and everyone at HoofbeatZ™.